I purchased 6 of these batteries, but only 5 of them had the LED indicator working. Called customer service and they were very helpful on how to return the defective one and fill out the warranty sheet. my only problem was that shipping was $3.75 for a battery that cost me $6.50. Love the built-in port with charge control. With a lightweight solar panel, I can have a backcountry power source. Bought this to avoid changing expensive CR123 batteries all the time and it really does the job. Works great and cheap to boot. Great little battery – cycles quickly when charging and the colored light in it is an added bonus. Very handy to charge. Longevity is yet to be determined. They are great. Have cycled a half dozen times, no issues. I had no issues with this battery. It is a quality item one would expect from Fenix. Works fine. A good choice for this device. Great product. Works well ! Can’t go wrong with these batteries. The USB charging is so convenient. They are great! We have been running them in some small lights from TRS. We haven’t had to recharge them since the initial charge. Best battery to date for me. Easy to charge works good so far. Very good idea to put a micro usb connection on the battery for charging. Easy as can be. 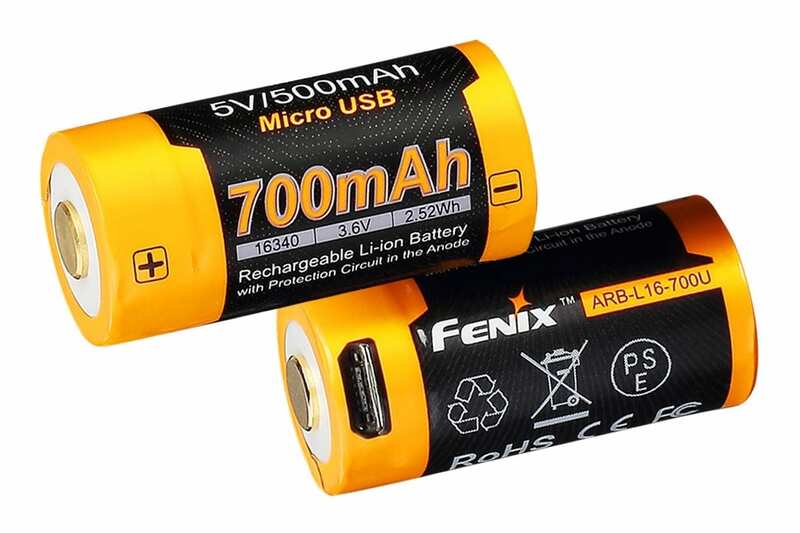 I’ve had very good luck with Fenix batteries and this one seems to be living up to my expectations. I charge it once a week and it lasts the whole time between charges. Great design, everyone has a micro usb cable ready to. No need for another charger to get misplaced! I really like these batteries. Easy to maintain since they do not require a special charger. I like this battery since I don’t have to bring a charger. Unlike some people in these reviews, I fully understand that, in order to have a charging port and circuitry INSIDE THE BATTERY ITSELF, I give up some capacity. I find 20% to be acceptable. If you don’t, then don’t get this battery. Get the non-U model that requires an external charger. Great little batteries. The USB charge capabilities is growing on me. So far the battery seems do it suppose to. I bought 6 of this batteries recently and conducted some experiments. It’s indeed really convenient to have the charging circuit integrated into the battery itself, making a travel simpler since you no longer need to bring a separate charger with you. However, this product seems to have LOWER capacity in comparison with its predecessor “ARB-L16-700” (without the built-in charging circuit). I gained a bit more capacities this time, but the result is still far from my expectation. Also, it looks like the charging circuit of my 4th sample is not good. Obviously ARB-L16-700U has a different cell core with ARB-L16-700, and this new cell core has about 20% lower capacity. This is UNACCEPTABLE.